Ernie Banks. In Tuscon? Late 1960s? Banks' swing was effortless, perfectly balanced, and generated power. Ernie Banks grew up in Dallas, TX. Watch the ball meet the bat. Hit the ball in front. Think of hitting a pitch with a hammer in your bottom hand: you would not make contact with the hammer beside your belly button, but rather with the hammer beside your front hip. Contact with the baseball should be made right at your front hip. The angle of the bat should be square to the hip, and the bat head square to the ball [as a hammer would be square to a nail]. This is more of a mental suggestion for swings in the upper part of the strike zone. It prevents chopping at pitches which are too high; it prevents a loopy swing. Southern Brother and I fight it out over this instruction near the bottom of this post. He prefers: "keep your hands above the ball". I think that is an unnecessarily complicated instruction for a young child. He argues he has successfully taught it to numerous young children. When you step in, make sure your bat can touch the outside edge of the plate. You'll never, ever be a hitter if you swing at high pitches. Let's talk about this one. It is the truest thing ever. Many hitters never reached their potential b/c they never stopped swinging at high pitches. Here's the cure for swinging at high pitches: swing level when swinging at the top of the strike zone. If you are swinging level, you cannot get your hands high enough to swing at a fantastically high pitch. I heard this from Texas Rangers coach Rudy Jaramillo. I like this one. Older children need to understand how to approach an at bat. We forget how little they know. You can think between pitches, when you glance at the base coach for a signal. Form your plan for the next pitch, then take a deep breath to 1) relax yourself, and 2) turn your brain off, then step back in. Now think with your eyes. Just react. You'd think even the smallest child would understand taking a deep breath to relax - but they do not - unless they are instructed. Swing loosey-goosey, but hit it with authority. 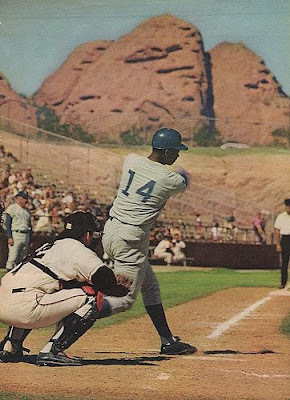 Ernie Banks is giving a perfect demonstration at top. This is my attempt at Harvey Pennick-type perfect verbiage. Tense kids also need to be taught to hold the bat lightly, as if they were holding a bird. I dislike the instruction: "Hit the ball hard", b/c kids do not understand the physics of bat-head speed, which are somewhat related to the physics of cracking a whip. The child reasons that they must tense up, and give hard effort, in order to hit the ball hard. Speaking of Harvey Pennick: Look for a pitch in your sweet spot. Alternate instruction: Look for your pitch. This is the equivalent of Pennick's famous "Take dead aim," b/c it takes a player's mind off of thinking and onto his task. It forces a player to visualize a pitch coming into his sweet spot. The visualization is the key. Everyone from Jack Nicklaus, to The Inner Game of Tennis, to Bob Rotella, talks about visualization. It is a very, very big deal in hitting. Also, kids don't watch much baseball anymore. They need to be encouraged to develop a loose pre-swing waggle. Kids typically haven't thought of such a thing. They will stand in their stances like brittle statues - unless they are instructed. Stand in the back of the box, to get a longer look at the pitch. 1) young players can see the plate better when it is out in front of them. Therefore, they develop a better idea of the strike zone. Think about it. If you are an inexperienced player, and the plate is always beside you, it is out of your vision, and you are just guessing about where it is. Your developing concept of the strike zone is stunted. 2) because young players have been instructed to hit the ball in front: when they hit from the back of the box, it especially reinforces this fundamental. Walk up to the plate (to stay composed and relaxed). If you strike out, jog back to the dugout. The walk back, after a strike out, is a moment ripe for mischievous acting-out. Shorten that moment. Decrease acting out. Have the player jog back. When you have two strikes, you're not looking to hit a strike - you're looking to hit anything the umpire might call a strike. If he called it a strike, you should've hit it. Whether it was a strike is irrelevant. If the unfairness of a bad call bothers you, don't let the count go to two strikes. When I was about 11, my Mom became frustrated with my letting good pitches go by. She began to encourage me to stay ahead in batting counts. For some reason, I had never thought of this before. The concept appealed to me. The rest of my playing seasons, I concentrated on staying ahead in counts (most of the time). This had the effect of sharpening my mental state. I had to be ready to hit from the very first pitch of each at bat. It created extra focus during each at bat, because I had to stay ahead in the count! It was a mental edge. I don't know how it would work for others, but it helped me be mentally sharp. I didn't realize that when I played, but I can look back and see it clearly. I like Al Oliver's advice: if you see the ball, hit it. You see some pitches better than others. Those are the pitches to hit. All my life, in batting practice, I swung only at strikes. As a result, my swing basically would not extend to reach a ball out of the strike zone. The swing would not cover that large of an area. Therefore, I could begin a swing at a pitch I saw very well, and would naturally stop if the swing wasn't going to be able to reach the ball. If felt very natural to stop in that circumstance. I never had to think about it, or work at it. I never reached my bat out to an area I hadn't already practiced hitting in. Somewhere along the way, I realized the good pitchers would be throwing low fastballs. Therefore, in practice, I especially worked on becoming excellent at hitting low fastballs - and I did become excellent at that. So, in tough situations, against good pitchers, they were looking to get me with low fastballs, and I was looking for them to throw a low fastball at the top of the knees. The system worked very well. Throughout my life, I had tremendous success hitting in pressure situations, and against the very best pitching. I think this approach - looking for low fastballs - was a big part of the reason. I've heard hitters say "I was looking for something inside that I could drive." I did that naturally, without coaching myself to do it. Especially if I had no strikes in the count, I was looking for a low fastball in my sweet spot - and my sweet spot was not low and outside. I would naturally let a low outside pitch go by, until later in the count. Throughout my life, I believed I was an excellent hitter in tough situations. I believed my teams were lucky to have me at bat in those situations. I often believed, of everyone on the team, I had the best chance of succeeding against tough pitching in tough situations. I would often be really wanting to win, and I would think "Thank goodness I'm coming up - my coming to bat really gives us a good chance to win this game," or "My coming to bat is bad luck for those other guys," or "Those other guys have no idea how much trouble they are in with me coming to bat. I'm the last person they want up there - even if they don't know it." Was that true? It doesn't matter if it was true or not! The important thing is to believe it - to have confidence. My father used to say "If you think you cannot, you cannot." He was right about that. One of my brothers would get into sharpened frame of mind by personalizing his upcoming confrontation with the pitcher: I'm too good to let this guy [this pitcher] beat me! This guy is not gonna beat me! I'm gonna get this guy. He will not win! He gave me this pep talk before some of my high school at bats, and this pep talk does build confidence. I would instantly realize: Hey, I'm too good to let this guy beat me! This guy is not gonna beat me! I'm gonna get this guy! I would come into at bats looking to see a low fastball really clearly. If I was seeing good, I might hit the first pitch. Sometimes I was seeing bad, and I would watch hittable fastballs go by - even maybe for strike two - because I just wasn't seeing them as well as I wanted to. With two strikes, I changed approach. I learned to visualize sort of a rectangular hockey net behind me, in the position of a strike zone. I learned to wait and wait and wait on the ball, before committing to it, and to only hit it if it was about to go into my imagined hockey net. In my mind, I was defending the hockey net - like a goalie. I would imagine each two-strike pitch was going to break, and I would wait for the break before I committed to the pitch. This meant, with two strikes, I was never perceiving a fastball which turned out to be a breaking pitch. If the pitch actually was a fastball, I was still able to flick my wrists and get sweet spot on the ball. Obviously, I was not a power hitter! However, I was often surprised at how far I could hit two strike pitches with what felt - to me - like a minimalist wrist flick, and with minimal associated body movement. 1) Competitive wiffle ball, with my brother throwing for blood. 2) Competitive ping pong ball baseball. This was played indoors. We hit by holding a wooden Texas Rangers' mini souvenir bat with one hand. The pitcher threw every type of breaking ball he could invent. If you could hit that wildly breaking ping pong ball with one hand on a souvenir bat, you could hit the toughest breaking ball any baseball pitcher could throw at you. 3) One day I took a jugs machine up the hill, and hit about 100 curve balls. By the end of that day, I had tremendous confidence. He could hit curves pretty well - until he faced a left hander's curve in 9th grade. He declared he had never faced a left hander's curve. A hunch: I don't think it occurred to Jake that he could hit the pitch anyway. I think he believed if he hadn't hit it in practice, he couldn't hit it in a game. Jake struck out both times he faced those curve balls. The moral, I guess, is to throw left handed curves to your kid with a wiffle ball, or a Jugs machine, or a left-handed friend - just so they get the thought in their head that they can hit the pitch. And that's about everything I know about batting - except for a bunch of technical stuff which is partly self-taught, and partly mangled second-hand gossip, and may not even be correct! So it's best to stay away from that! Update: Big thanks to Southern Brother for writing in with some excellent technical advice for advanced hitters. Since Southern Brother is a college baseball coach, his technical advice is cutting edge! I've always wanted this blog to be cutting edge! 1. the baseball swing is NOT level nor should you teach swinging level...what you should teach is to keep your hands ABOVE the ball. You stated to stay off high pitches, correct, the reason is because you can't keep your hands above the ball on high pitches. Southern Brother expects an advanced player to quickly process this and then to never give it another thought. For young players, I don't like "keep your hands above the ball". What young player can understand this? Confusing. Further, I suspect the instruction tends to focus a child's attention on his hand position - and no one wants that. Southern Brother doesn't want that. A child's focus ought be: put sweet spot on the ball. On pitches at the top of the zone, I prefer "swing level". It's simpler, and there's a subtle mental distinction in favor of focusing on putting sweet spot on the ball. Update: Southern Brother writes in and stands up for "keep your hands above the ball". He argues he has successfully taught it 9 and 10 year olds. Me: 'you CAN see those seams...I KNOW you can see those seams! '...Son: Uh, well, they are red.' I lost it! and he adds a fundamental he forgot to mention: in the stance, front elbow s/b centered in middle of chest. 2. Take your back hand and punch it up past your body, and to do this you have to take that back hand down to the ball and through it ... in that hammer movement Ted Williams talked about in his book Mom had for years, your back elbow has got to SLOT against your ribs to allow your hands to be thrown forward in the hammer movement. Left handed power hitters are famous for perfect slots of their back elbow, Williams, Musial, Mantle, Ruth, Maris, Reggie Jackson, Bonds, Ryan Howard. 3. Misc Modern terms you will hear given today and what they mean. You have to read the seams: that's how you recognize pitches. You don't just look at the ball. Rather: read what the seams look like. After a pitch, can you describe what the seams looked like? To see the ball big is to recognize the pitch, when you do that the ball will look larger to the hitter. Hitters get in trouble when they try to hit the ball to far in front of their body, causing them to reach, or be fooled on the pitch. When you see it big, let it travel, and let it get deep (closer to the catcher) you increase the percentage of hitting the ball hard on a line. Contact with the baseball should be made right at your front hip. The angle of the bat should be square to the hip, and the bat head square to the ball ... not inside the ball, or around the outside of the ball. When the back hand drives up through the hitting zone and past the body, the hands need to stay inside the ball so you can square it up on contact. If your hands have a rounding swing, the bat head comes over the top and rounds the ball with a groundout. If your hands are on the same line of the baseball then they dip/loop and a pop up fly ball is hit. Staying inside the baseball is the best fundamental to help hitting the ball on the sweet spot. Willie Mays said you have to go back in order to go forward. To physically torque the body to produce the most power and bat speed your weight has to be transferred to the backside before the swing begins. The stance should be slightly wider than your shoulders and balanced. As the pitcher starts his leg kick, the hitter starts his load/weight shift to the instep of the back foot. Keeping the weight through the inside of the back foot allows for the body to stay balanced and proper physics to be applied in the swing. Golf instructors have studied and copied the baseball weight shift with a modern swing mechanic called the peg and stem where the back leg stays straight and firm to allow the body to turn against it as a pendulum for the highest amount of tourque resulting in higher faster swing speeds and longer drives. In the stance, the front shoulder should be lower than the back shoulder. The hitter's shoulders ought be a bit closed. When the hitter loads his weight (closes his shoulders a bit), the hips should follow along with the shoulders, i.e. the hips should turn and rotate inwards at a similar angle to the shoulders. Beware: telling a batter to keep their head in is a confusing instruction, negative, and frustrating to the hitter. Instead, if you tell the hitter to stay in with their shoulder and hips, then their head automatically follows. 4. Keep the bat OUT of the back of the hand and thumb. Lay the bat in the fingers and align the knuckles. 5. Pitchers pitch to locations. Hitters need to look for a pitch in a location, then don't miss.